IITA‘s Germplasm Health Unit (GHU)—as part of the CGIAR Genebank Platform—and its stakeholders lead the celebration of Phytosanitary Awareness Week, 23-27 October, at IITA. Lava Kumar giving a presentation during the Phytosanitary Awareness Week in IITA, Ibadan,Nigeria. Phytosanitary Awareness Week was celebrated in 11 other CGIAR centers, which organized events to highlight the importance of promoting and creating awareness on sanitary, phytosanitary, and plant health issues; how to carry out preventive measures against pests and diseases that can be transmitted; and the role of CGIAR GHUs in the international distribution of pest-free germplasm. 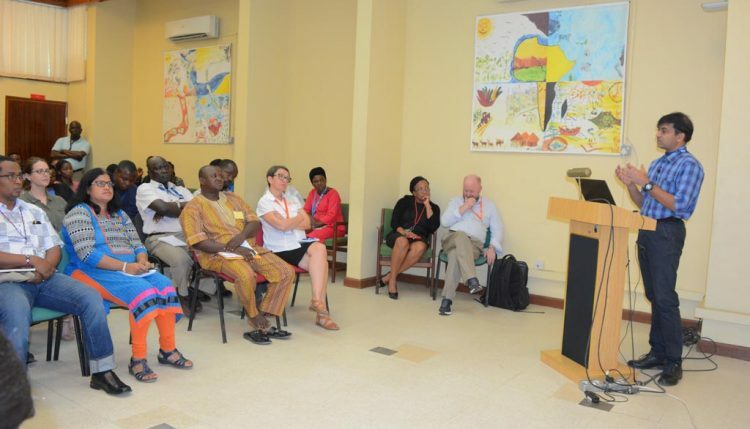 At IITA, Ibadan, GHU convened a seminar on 25 October, to promote awareness and exchange ideas on the importance of germplasm health in preventing the transboundary spread of pests and pathogens. The seminar was the highlight of the week’s celebration, with Head of GHU and Virologist Lava Kumar, and also coordinator of the GHU Component of the Genebank Platform giving a presentation titled “Germplasm Health: Interplay of legal and technical factors in mitigating biorisks to germplasm conservation and distribution.” It was attended by IITA staff, students, and National Agricultural Quarantine Service (NAQS) officials. 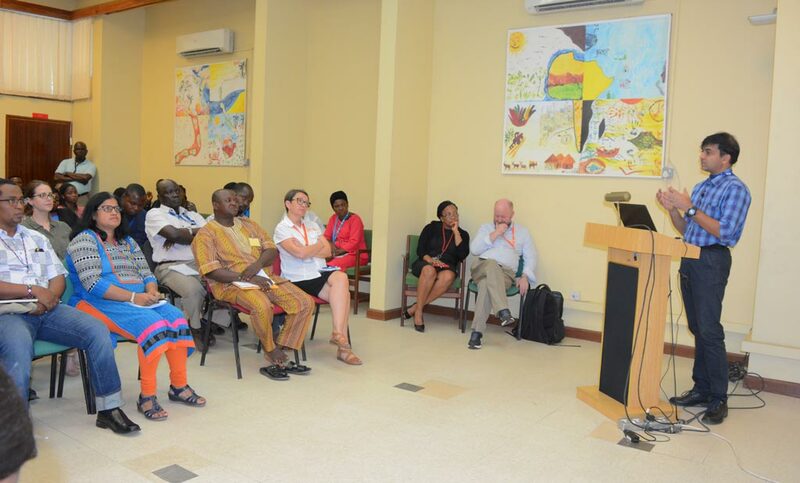 In his introductory remarks, Michael Abberton, Head, IITA Genetic Resources Center, gave an overview of the Genebank Platform and encouraged stakeholders to continue their efforts to move the agenda of preventing the spread of pests through germplasm forward. In his presentation, Kumar gave an update on the safe distribution of germplasm and what the CGIAR centers are doing with regard to phytosanitary compliance in germplasm exchange. Kumar also highlighted the importance of germplasm health, improving biosecurity policies for risk mitigation, global capacity to handle invasive threats, policy regulations governing the international distribution of germplasm, guidelines for plant health monitoring, and approaches to ensure germplasm health. “As an institute involved in international germplasm movement, if we are not careful, our germplasm can carry diseases into other countries, which could cause disease outbreaks,” he said. CGIAR’s agri-food system, which has the highest level of international germplasm distribution worldwide, ensures that the GHUs provide phytosanitary services to genebanks. GHUs have a crucial role in supplying disease-free materials directly to seed systems for multiplication and distribution to farmers and partners. Every year CGIAR centers attend to over 2,000 requests for seed, clonal, and tree germplasm from more than 100 developing countries. In the course of the program in IITA Ibadan, there was a meeting between the NAQS and GHU where training needs of NAQS staff for 2018 and the lab infrastructure development plan were discussed. The Awareness Week was implemented by four teams: the first to inform on the status quo, the second to provide an update on the latest developments, the third team to encourage internal users and their partners to comply with phytosanitary regulations, and the last team to initiate new partnerships and strengthen existing partnerships. In his concluding remarks, Ogunfumilayo Akindele, Head, NAQS, Post Entry Diagnostic Station, commended Lava Kumar, the GHU team, and IITA as a whole, for being the lead research partner facilitating agricultural solutions for a food-secure Africa. “NAQS supports this partnership with IITA. We pledge to support and work hand in hand with this outstanding institution to fight against germplasm contamination; because IITA doesn’t stand for Nigeria alone; the institute stands for Africa. CGIAR genebanks located in centers of crop diversity host more than 750,000 accessions of vital food, forage, and tree crop germplasm, including cassava, maize, rice, potato, sweet potato, groundnut, sorghum, chickpea, bananas, in addition to thousands of improved varieties bred for resistance to pest and disease, resilience to climate change, and richness in micronutrients such as pro-vitamin A. The IITA Genebank in Ibadan, Nigeria, represents the single largest collection of invaluable genetic resources of major food staples such as cassava, maize, yam, plantain, cowpea, and other legumes in sub-Saharan Africa. Crop germplasm is a high-value commodity and the germplasm conserved in the CGIAR genebanks and the improved varieties developed by the breeding programs are regularly exchanged at a high frequency with national and international programs for crop improvement, diversification, food production, commerce, and agricultural development. Germplasm exchange, however, has inherent risks of introducing exotic pathogens that include viruses, fungi, bacteria, phytoplasma, weeds, insects, and nematodes. In CGIAR , GHUs have been established in centers involved in crop improvement research. These include Africa Rice, Bioversity, CIAT, CIP, CIMMYT, ICARDA, ICRAF, ICRISAT, IITA, ILRI and IRRI. The GHUs enable the exchange of healthy and pest- and disease-free germplasm between and among centers and partners in various countries in accordance with the requirements of the national plant protection organizations regulations and the FAO International Plant Protection Convention (IPPC). GHUs provide vital support to genebanks and breeding programs in production and maintenance of pest and pathogen-free germplasm for conservation and use. Collectively GHUs, genebanks, and crop improvement programs ensure germplasm distributed from CGIAR centers are healthy and of high quality and, meet the phytosanitary requirements of the national and international legislation. GHUs develop phytosanitary procedures to eliminate pathogens from germplasm and create versatile diagnostics tools for health indexing tests for screening invasive, exotic and endemic pathogens. The Units track changes in global pest and pathogen profiles and develop appropriate controls to tackle new challenges. They work proactively to transfer knowledge and technologies to build phytosanitary capacity among partners programs. “Germplasm health is one of CGIAR’s unknown success stories,” Kumar said. “CGIAR has the highest level of international germplasm distribution worldwide. Every year CGIAR centers attend to about 2,000 requests for seed, clonal, and tree germplasm from more than 100 countries. The majority of these requests are from developing countries.